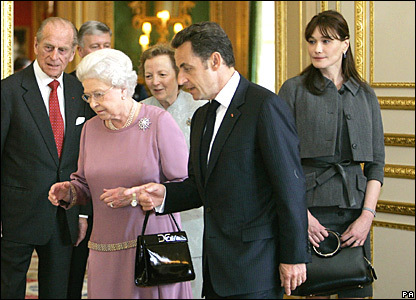 France's First Lady was among the listeners to Mr Sarkozy's speech at the start of the Guildhall dinner. 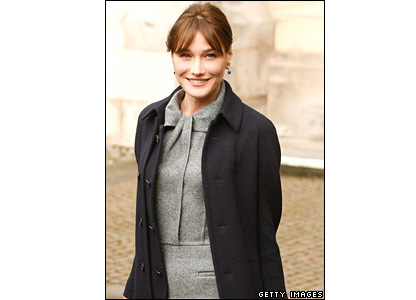 Mrs Bruni-Sarkozy was one of the more elegant figures at the state banquet held at the Guildhall in London. France's new First Lady made a demure first impression when she arrived in the UK for a state visit. Some papers said she was a cross between Jackie Onassis and Princess Diana. Ms Bruni-Sarkozy has eclipsed her husband, in more ways than one, during their whistle-stop tour. His heels may also have overshadowed the politics. Her love affair with grey continued with this second outfit. The Dior handbag was a permanent fixture. Spot the difference. Grey again, and the navy coat is Dior. But the hair is up. Loyal to the very tip of her toes. Ms Bruni-Sarkozy was a walking advertisement for French fashion house Dior. A picture of elegance. But again, conscious of her Amazonian stature, Ms Bruni-Sarkozy finished off her floorlength, blue silk gown with a pair of flats. The second day of the visit started off on a more colourful note but look closely and there's a grey suit underneath. And yet another pair of flats. Just for comparison - Ms Carla Bruni-Sarkozy in her previous life as a model, not so demure and wearing heels.